Sunday is the telecast of the 83rd Annual Academy Awards and if you're like me you love to invite a few friends over to watch the show, diss the fashions and enjoy all the Hollywood hoopla that goes on. 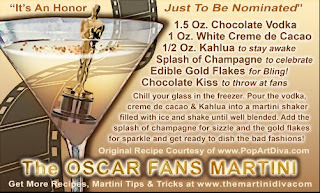 I always serve up my Academy Award - Oscar Martinis and some fun snacks to get us through the hours of speeches, clips and - hopefully - funny jokes from the host(s). Is it too much too hope that maybe the producers might loose a little control this year and we might get to enjoy a classic bit of Oscar history like that again?